The buyer displays embroidery designs and color combination used on wall hangings. Chaman Das explained the product finishing cycle along with cost and material used for different products at the finishing unit. The buyers briefed the artisan women on the local market trends and the best selling products. Buyer in Mithi Market, Umerkot, displays products to highlight the demand of consumers. As a small district in interior Sindh, Umerkot has a limited a market space for rural artisans to expand their handicraft business to be able to reach large consumer groups. To expand this outreach, twelve Sales and Marketing Agents (SMAs) from among the rural artisans in Umerkot, were facilitated with a market exposure visit to Mithi and a two-day Capacity building Training. 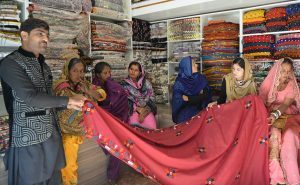 This exposure opportunity aimed at building artisans’ awareness on new market trends and consumer demands outside of Umerkot district and familiarizing them with product pricing, bargaining with middlemen and customers and creating market linkages that will enable a sustaining business environment for these women artisans from remote villages of Umerkot. Buyers at the Mithi marketplace warmly welcomed the SMAs from Umerkot and made them comfortable enough to display their finished products, the materials with which they were produced and prices at the foreign market. The artisans were overwhelmed with joy to see their traditional embroidered and appliquéd products being well-received and valued among buyers in Mithi. Potential buyers and renown retailers of Mithi, such as, Nathoo Raam Block Printing and Handi Crafts, Mama Handi Crafts, Waswani Handi Crafts and another local entrepreneur, met with the Umerkot artisans and showed them their own products as well to give them an idea of the product cycle, latest market trends and best selling products. These experienced retailers further shared tried and tested, successful, marketing techniques with the artisans to enhance their business circle, networks and advertising skills. This was a new learning for the artisans and they openly welcome it as it would surely help in building their handicraft enterprises. Most of the handicrafts salesmen in Mithi encouraged the SMAs to invest in producing new products by using locally available raw materials and fabric. One of the local entrepreneurs displayed his new range of products, including purses, handbags and pouches, made from shawls that are easily available in local markets, of different designs at his finishing unit and told them how popular these products were. 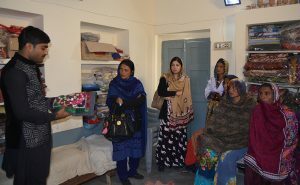 During the visit, the SMAs from Umerkot received an order of hundred cushions from a popular Mithi retailer, Loveraj Handicrafts. The artisans dealt with confidence and professionalism with their customer and assured him that the order given would be timely completed, with utmost attention to quality. expressed Naz Pari, SMA from Village Talo Malo, Umerkot.